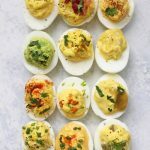 My Guide to Perfect Deviled Eggs – My FAVORITE method for deviled eggs plus TWELVE delicious flavor combinations! All are paleo approved, gluten free, and absolutely delicious. 1. Start With Good Eggs. 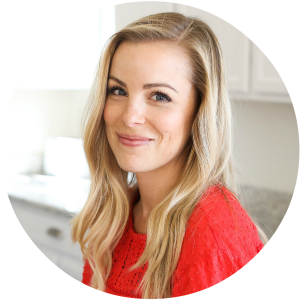 I shared this in a recent newsletter, but the method I absolutely SWEAR by is steaming your eggs. Hard-boiled eggs work best when your eggs are “old,” but it’s hard to tell these days exactly how old your eggs are. And sometimes that means you end up finding out too late (i.e. when you’re trying to peel them) that your eggs were fresher than you thought and now the whites are cemented to the shells and what you have isn’t fit for deviled eggs. Steaming is fail-proof. It works across all different brands of eggs, all different levels of freshness, and I haven’t mangled an egg white yet. PREP YOUR PAN. I added about 1-inch of water to a saucepan, inserted a steamer basket (like this or this) and brought the water to a simmer. POKE A TINY HOLE. Using a push-pin or needle, poke a small hole in one end of your eggs (gently so you don’t smash the whole thing) This gives the air-bubble somewhere to go and makes them easier to peel later. ADD THE EGGS. When the water is simmering, put your eggs in the steamer basket in a single layer. 13-15 minutes for hard boiled. 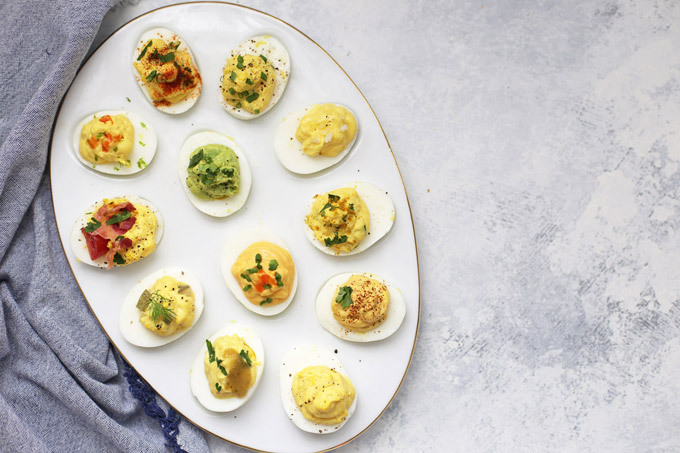 If you’re cooking a lot of eggs at once (10-12), you’ll probably want to lean toward the 15 minute range, possibly up to 17 minutes, depending on how hard you like them boiled. Then all you have to do is peel them! I run the cooked eggs under cold water or put them in an ice bath (bowl with ice and water). Then I crack the shells gently all over, and they slide right off! 2. Add a good base. I use a combination of mayonnaise (or vegannaise) and mustard (just the yellow stuff) and then a tiny bit of acid (vinegar, pickle juice, lemon or lime juice). My favorite kinds of mayo are homemade (that version is paleo/whole30 approved), Primal Kitchen (made with avocado oil), and Just Mayo, which is actually veganaise. If you’re not a big fan of the flavor of mayonnaise (like me), you might want to try Just Mayo brand. It’s made using pea protein, so it’s not paleo, but it IS much more neutral and lends the same creaminess without the strong mayo flavor. 3. From there, get creative. Don’t be afraid to experiment with flavors. You can take these in so many directions without a ton of fancy-pants ingredients or extra effort. 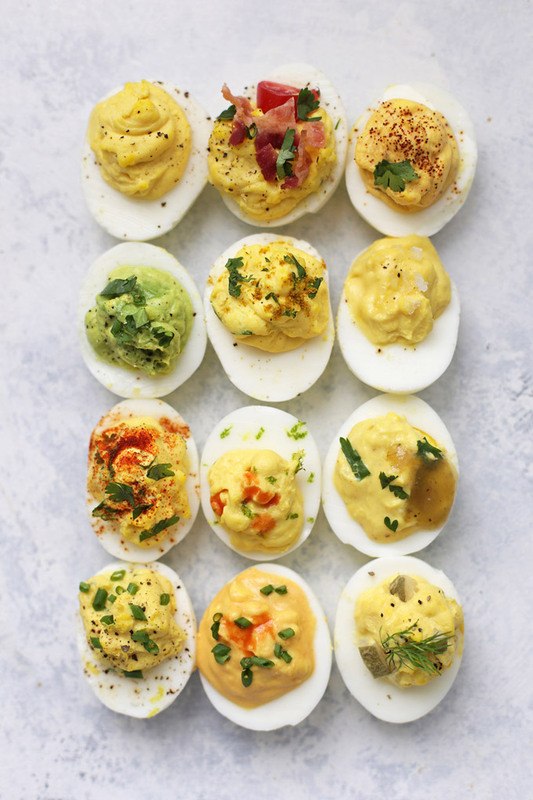 Heck, you can get creative simply by changing out the mayo or mustard you use–try chipotle or sriracha mayo, Dijon or jalapeño mustard, etc. It can be really fun to experiment! 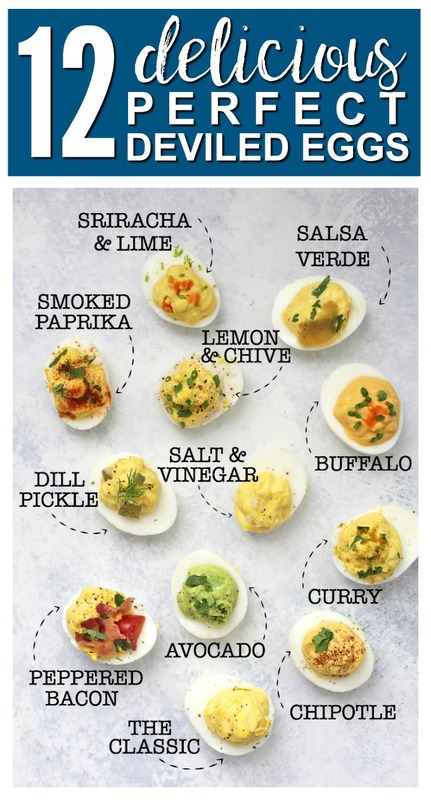 Below I’ve included my favorite method for deviled eggs, plus all TWELVE variations I came up with. I’m sure you could come up with twelve more! There are a lot of ways you can do this–you can use a fancy piping tip, you can use a spoon, etc. My favorite way is to put the yolk mixture into a zip-top sandwich bag and snip off the tip of one of the corners to use as a piping bag. My other big tip is to put something as garnish on top–even if it’s just a bit of extra salt and pepper. I love fresh herbs, a little bit of dried spices or herbs, some fresh toppings (like tomatoes, bacon, etc.) or a little drizzle of hot sauce. Slice each egg in half lengthwise and remove the yolks. Place all yolks in a medium-sized bowl. Add mayonnaise, mustard, vinegar, and a pinch of salt and pepper to the egg yolks. Mash with a fork (or beat with a hand mixer) until completely smooth. 1. 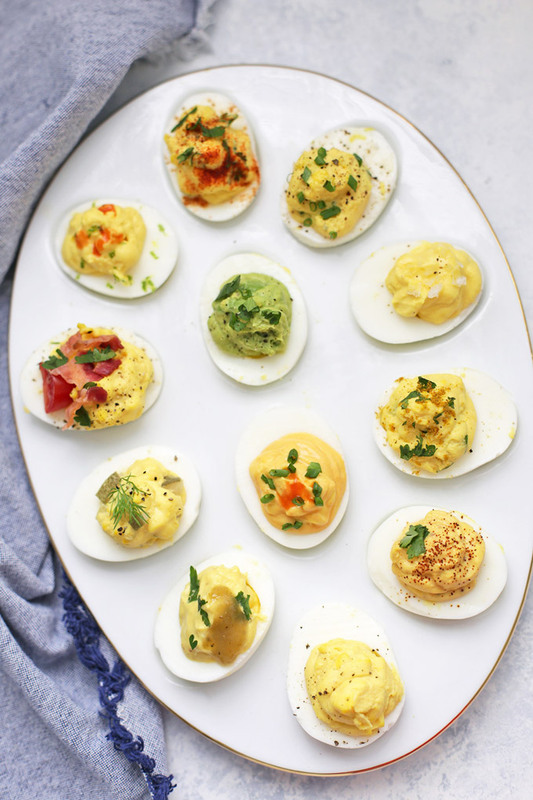 Classic Deviled Eggs: Follow directions above. 2. Dill Pickle: Use pickle juice as directed, and add 1-2 Tbsp finely chopped dill pickle, and a pinch of dried or fresh dill to your yolk mixture. 3. Peppered Bacon: Add 1 Tbsp fresh herbs (cilantro, dill, basil, or parsley) to your yolk mixture and swap 1/4 tsp steak seasoning for the pepper. Top with crisped, crumbled bacon, additional fresh herbs, and halved baby tomatoes. 4. Smoked Paprika: Use lime juice in place of the pickle juice. Add 1-2 Tbsp fresh cilantro (optional) and 1/4 tsp smoked paprika to the yolk mixture. Top with additional smoked paprika, as desired. 5. Lemon Chive: Use lemon juice in place of the pickle juice. Add 1-2 Tbsp fresh minced chives and an extra pinch of pepper to the yolk mixture. Top with a tiny bit of lemon zest and a pinch of fresh chives. 6. Curry: Use lemon or lime juice in place of the pickle juice. Add 1/4 – 1/2 tsp yellow curry powder to your yolk mixture. Top with minced cilantro or additional curry powder, as desired. 7. Sriracha Lime: Use lime juice in place of the pickle juice. Add a few drops of sriracha to the yolk mixture. Top with a tiny bit of lime zest and additional sriracha as desired. 8. Chipotle: Use lime juice in place of the pickle juice. Add 1-2 tsp adobo sauce from a can of chipotle peppers (start small if you don’t want it hot). Alternatively, you could use 1/4- 1/2 tsp dried chipotle chili powder. Top with cilantro and additional chipotle powder/sauce as desired. 10. Salt and Vinegar: Use vinegar in place of the pickle juice, and add an extra 1 tsp to the mixture. Top with coarse sea salt (like Maldon salt). 11. Salsa Verde: Omit pickle juice. Add 1-2 Tbsp salsa verde to the yolk mixture. Add fresh cilantro, if desired. Top with cilantro and more salsa, as desired. 12. Buffalo: Add 1-3 tsp Frank’s Red Hot (or other favorite hot sauce) to the yolk mixture. Top with fresh chives or dill, as desired. 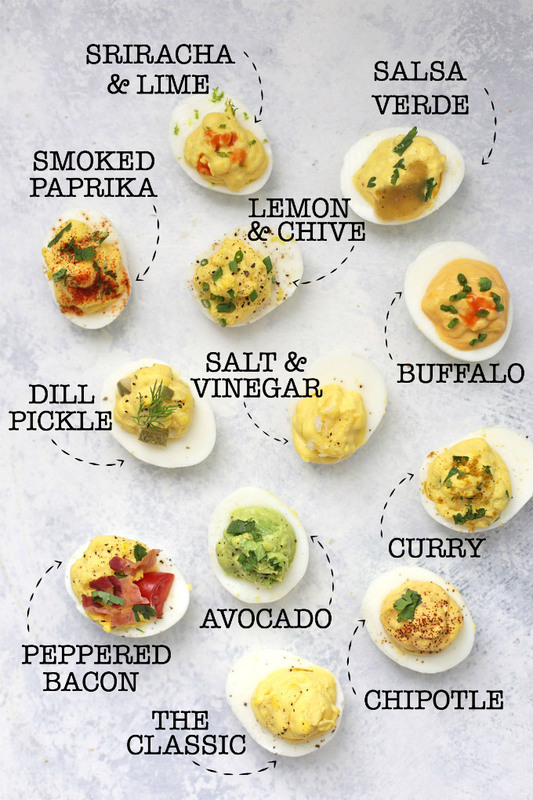 I did the dill pickle one but added a twist by pickling the eggs first. Simple as can be. Just put peeled hard boiled eggs in with your dill pickles jar for a few days. They turn soft green which adds to the taste and presentation. What a yummy twist! I love dill pickle anything, so I’ll have to give your tip a try. Thanks so much for sharing! Love…. just love Dill Pinkles. I use a tad of horseradish with them adds a bit of Zing . Does mustard just go into the base of the classic?